Utah Experiencing a Meteor flap or is it something more? 10/16/03 10:40 am Thursday morning, a soldier on the firing range at Camp Williams looked up to see a blinding flash, and then a long contrail. It was a sight many others would see over the State of Utah. Reports of an Explosion and debris field, A Meteorite? A UFO? that is something that yet has to be determined. First it was reported over Camp Williams then Salt Lake City and Bountiful. The SLC International Airport took immediate action and diverted two planes. The FAA said there was no aircraft in the area, so there is alot of conflicting data, is this event being downplayed or covered up? The Salt Lake Tribune & Deseret News apparently didn't think this event was newsworthy, Nothing appeared in either newspaper. We received a report of the object being seen as far East as Hanna, Utah at 10:35am which is considerably east of Salt Lake making this event even more strange. Did this object make a turn? Another Meteor /UFO in Wendover? UUFOH: we have acquired the contact info and are working on a follow up and obtaining the footage. And then another Meteor event? 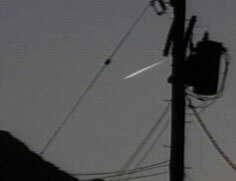 Caught another piece today 10/22/03 about another meteor over Salt Lake .I think it was on Fox 13 but not sure..... UUFOH: any information on this event please contact us! This is possibly three so called meteor events within a weeks time in Utah. We will continue to look into these events and follow up on any reports or information. "I thought, you know, I'm sitting out here taking UFO pictures," says Brad Gygi, an eyewitness. Utah The New AREA 51? Utah National Guard NCO reported a "plane in distress" falling in the sky over Camp Williams south of SLC. As precaution and in standard operating procedure in the event of a pending air crash, the Salt Lake City International Airport stopped two airliners from landing. But the FAA said there weren't any aircraft in the area. When the NCO's report reached higher authorities, NORAD at Cheyenne Mountain, Colorado, became involved. As of this date, NORAD has not released any official statement about the NCO's report. The unofficial guess is that the object was "probably a meteorite." IT'S FAIR TO SAY RIGHT NOW, IT'S STILL AN UNKNOWN? "I would say yes. We haven't come to any conclusions. We basically just fill out our reports and take them to higher headquarters and wait for a response from them." "Naturally, with the war going on, I thought, 'oh, oh, what do we got here?' And then I recognized it immediately as a comet or a meteor because of its shape and the way it was going and then when it exploded and just disappeared, I figured it just burned out in the atmoshpere." "I was lucky to get a couple that did turn out," says Gygi, of his pictures. Brad Gygi was on his way to work and was lucky enough to snap a few photos before 'it' exploded. "It looked really big, a lot bigger than when you see a plane flying across or something and it was pretty bright and it looked like a pretty long tail," says Gygi. "I just feel like anybody who didn't see it, missed out. It was beautiful. It was just wonderful to see it." However one thing is certain the official report is they really don't know for certain what it was? And also for certain , it was significant enough to close the SL international airport. and NORAD denied the report that they were searching or investigating. They referred us to US Strategic Command at OFFUTT AFB who told us that they "only track man made objects" -------a laughable response. We are pretty well plugged into the bolide community, so we will try there. Do you think it was a Meteor?